I'm Just Sayin': All Day?! 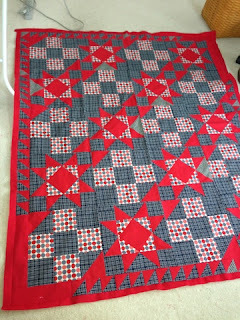 How is it possible that it has taken me all day to finish a quilt top and prepare a backing when the top was pieced long ago? 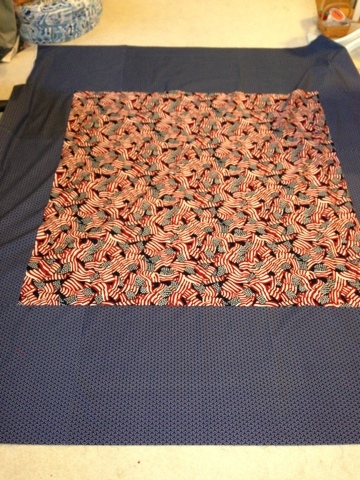 This is a Quilt of Valor, pieced using a mystery quilt pattern provided so generously by Nancy Dennis from the yahoo group called MysteryQuilts4Military. It was a recycled pattern, written when the size criteria for QOVs was smaller, so it required some framing borders. I used the scraps from the flying geese units and made this border, but it STILL wasn't quite big enough. One of my problems is that I didn't have any extra fabric, except the solid red. I then took forever to piece a backing with some American Flag fabric bordered by a Japanese-looking navy blue print, also a scrap, so it took a lot of piecing together of odd sized pieces. Still, I managed to use at least four yards of fabric.